What Does the 30-Day Free Trial Include? A fully functional conference call line. Access to your web-based control panel. When you first log into your control panel, click on the 'instructions' tab to see the phone numbers your attendees should use... and everything else you need to know. A big problem in the conference call industry is when the PHONE COMPANY has a capacity problem because of weather, peak-calling times, or someone else's huge teleseminar event -- and your callers get a fast-busy. This actually happens a lot. SuperConferencePRO.com is the only conference call company that provides a geographically distant backup number, and an emergency "alarm will sound" number. 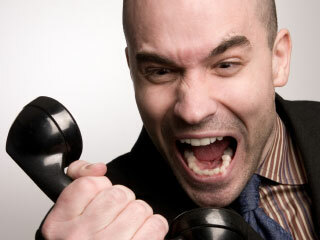 With most conference call providers, your event is toast -- there's nothing you can do. This is the dirty little secret of the conference call industry. Nobody likes to talk about it because nobody has a solution. But SuperConferencePRO addresses this problem two ways. First we give you and your guests a backup number that's located in a DIFFERENT part of the country. Second, we give you and your co-hosts a second backup number -- an EMERGENCY backup number that uses a completely DIFFERENT phone company. And what's cool about the emergency backup number is when it gets used, an alarm sounds in our operating center -- so we can be notified about the phone company problem without you having to call us separately -- you get to focus on your event. That's very important. Big Problem #2: Full Call, No Room for Host! This capacity problem doesn't happen too often, but when it does you PANIC. Imagine you're doing a sales conference, and your marketing does great and BOOM - your conference is full. Ever get dropped from a call? 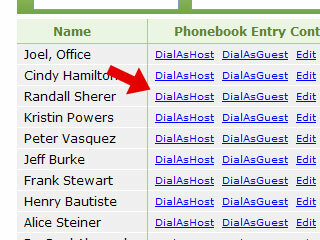 SuperConferencePRO.com always lets hosts dial-in -- no matter how full your call is. That's a good problem to have, right? Not if you're the host and YOU can't get in! Most conference call companies set firm limits on your account. But we ALWAYS lets hosts call in. We don't care how full your call is, we figure -- of all people, YOU and your Co-Hosts should always be able to get in. And we don't charge extra for this. It's just part of the service. Click on the 'who's on tab' and BOOM -- you see everyone on the call. You can mute, un-mute and more. A very common problem with conference calls is confusion on the part of the host. For example, it's common not to be sure if the guests are muted or not... especially at the beginning of your call. So maybe you ask your guests a question, and you get no response... SILENCE... it's embarassing. Then you realize you had everyone muted. That's even more embarassing! 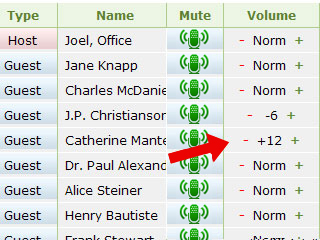 With the SuperConferencePRO.com control panel you can clearly see who's muted, and who's not and you can also see which conference-mode you're in... Interactive mode, where guests can talk, or Lecture mode where guests are muted -- and you can switch between modes with a single mouse click. Guest presses a button to 'raise their hand'. You see it in the control panel. You click to un-mute them. Easy as Pie. Now let's say you're in lecture mode, but someone has a question. They can't talk because they're muted! They press *2 on their phone, and that raises their hand. You can see their raised hand here. When that happens, unmute them to let them talk, and then lower their hand. It doesn't get any simpler and easier than that. One of the BIGGEST problems with all conference call systems -- and nobody ever talks about this because no-one else has a solution -- is when one speaker has a different microphone volume than another speaker. It completely ruins your call because it's very distracting to the listeners. Different phones and phone-companies set the speaking-volume differently. No problem -- you can raise or lower the microphone volume of any speaker with a single mouse-click. I'm happy to say we've completely solved this problem. You can raise or lower anyone's volume with a single mouse click. How cool is that? Important! : Don't be confused. Other conference call services only let LISTENERS adjust their listening volume. That doesn't solve the problem -- in fact, it makes it more distracting. This feature puts YOU in control of your call. Now let's talk about the MOST COMMON problem of all -- when someone essential to your call doesn't show up on time -- maybe they forgot about the call... got the time wrong... got busy... wrote down the wrong number... who knows, it happens for a lot of reasons, and it happens ALL THE TIME. No other conference call system I know of has a solution for this... how could they? Use the 'Phonebook' tab to store important names and phone numbers. 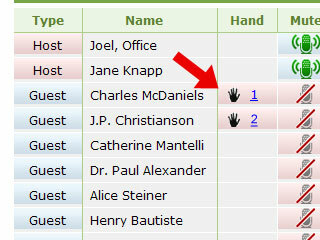 Click 'dial' and you can add them to your call instantly! This feature is a life-saver. But we have a soulution. It's called the 'dial-out' feature, and you can find it on the phonebook tab. This is where you can keep a list of all the important people you might need on your calls. 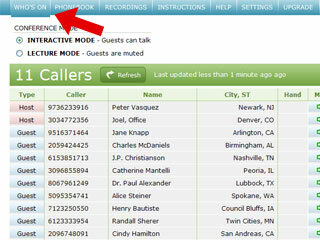 Click the dial-link, and BOOM they are added to the call as a host or guest -- your choice. How cool is that? We call also this the 'Let's call grandma' feature -- because you can get your whole extended family on the line very easily, and then place a call to grandma. She'll love the surprise. This feature is life-saving when your featured speaker is missing... And if you're a coach, or if you're in a phone-based mastermind group, or if you do lots of small-group calls you'll come to LOVE this feauture because when you're ready to start the meeting, and one important person isn't there, BOOM you can solve that problem instantly. Now, let's talk about recordings. SuperConferencePRO.com' recording interface could not be easier. And we never overwrite recordings. If you're using your confernce line for business, making and saving recordings is one of the most important things might ever do with your conference line -- and yet so many conference call services design this wrong. 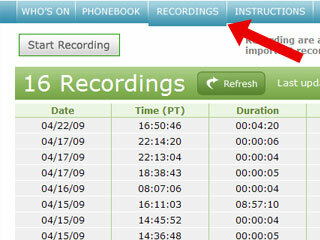 Most use a phone-interface to start and stop recording -- but then you're never really sure if the system is recording, and with some systems, your not sure whether or not you're overwriting previous recordings..
SuperConferencePRO.com uses a simple and elegant web interface. And we never overwite recordings. Just click 'Start Recording' and you're recording your call. When you click 'Stop' your recording stops and it appears right here, ready for you to use. How simple is that? So as you have seen, SuperConferencePRO.com is simple and easy. It's powerful. And it gives you peace of mind. It has a ton of feature nobody else has, and they are important features that really make a difference. With this selection of features I believe SuperConferencePRO.com is credibly the best conference call system in the world for the vast majority of conference call users. But it doesn't matter what I think. It's what you think that counts, and that's why I'd like to offer you a free 30-day trial of our service. The 30-day trial will give you a chance to fully explore the service without risk. To sign up for the free trial, just click that 'Sign up for Free' button, fill out the form, and you'll get everything you need. Thank you for your trust and confidence. I look forward to welcoming you as a new client.